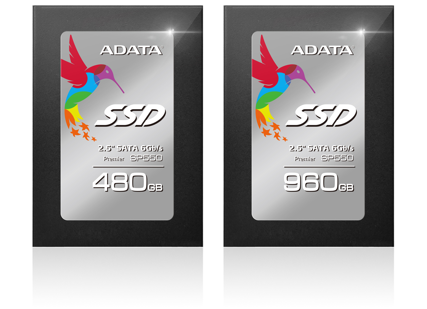 ADATA has just launched the Premier SP550 SSD, which uses triple-level cell (TLC) architecture to offer an affordable SSD without compromising performance. The Premier SP550 is the first ADATA drive to include the Silicon Motion (SMI) SM2256 controller, which uses NANDXtend technology to help ADATA implement SSD technologies such as data shaping, LDPC ECC, and a RAID engine for enhanced data protection, stability, and reliability. SLC caching technology has been implemented to boost performance. “Our Premier SP550 SSD integrates superior TLC NAND carefully selected and refined with ADATA quality assurance to deliver leading performance, data reliability, and endurance. It provides customers a clear choice for the best storage experience”, said Kevin Chen, Vice President of ADATA. The Premier SP550 uses TLC flash and the latest SMI controller as a great upgrade solution with a superior cost-performance ratio. Compared to other SSDs, it features outstanding durability, as indicated by higher total bytes written (TBW) ratings, which mean the number of times a drive can write a specified capacity in one lifespan. While a TLC SSD, the Premier SP550 employs SLC caching for faster read/write performance when needed. It further supports SATA DevSlp (device sleep) low power mode to reduce electricity costs and provide longer notebook battery life. With low-density parity check error correction, or LDPC ECC, data errors are minimized and SSD life is extended. Smart data shaping also maintains consistent operation and prevents NAND flash wear by evenly distributing drive loads, while a RAID engine boosts data reliability. Bundled software includes Acronis True Image HD, which enables quick data migration to new systems. ADATA Toolbox software includes utilities to monitor and manage the SSD, with drive status, wear level, and lifespan info.